At the end of February 2019 we released DevOps 1.5 containing a lot of new features (Read all about Release 1.5). As part of this release, we also added several new data extractors in order to enrich the total amount of information we have for each of the SAP Systems which we monitor and track on a daily basis. Today we extract information regarding SCI Code Inspections, Transports, Dumps, SQLM data, UPL, AppStats and Webstats, just to name a few. That ends up being a lot of very valuable data, which is used in all our different reports and dashboards in Gekkobrain DevOps, when you are conducting a detailed analysis. So the next very natural step for us is to look into how to automate “the detailed analysis” of all these incoming data and deliver easy-to-use insights which you can turn into actions right away. The automated analysis in Gekkobrain DevOps runs continuously and checks whenever e.g new dump information is received or some of the other many data sources are updated. So new data means a new analysis, which will turn into valuable Actionable Insights delivered directly to you either per mail, Slack or other channels. So all the data and information we collect, you can categorize as the “What, When & How much” and the Actionable Insights we build on top is the “Why & How”. 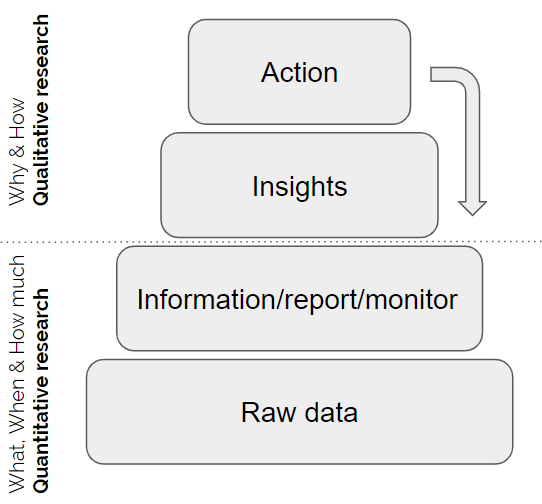 What are insights – and how will we make them actionable? So, what defines a good insights and how do we make them actionable. A good way to illustrate this would be to look a bit into another direction as inspiration. If you were working within the field of biology and were given a task to figure out whether the water quality of the nearby river was good or bad, you might be tempted to go there on a daily basis and measure the oxygen level, the water temperature and the level of fertilizers/pesticides and a lot more. You might do this during the following weeks/months and realize that the values might have a tendency to fluctuate, and it would take some time to figure out how they might interfere/interact with each other, making it difficult for you to come up with the first conclusion. Within biology there is a much better approach to find this first conclusion on water quality. That is to look at the species living in the river, some species might be an indicator for a good water quality and others for a bad water quality, some might even point to the underlying problem. A valuable insight that can be a guidance for how and where to look if you wanted to improve the water quality. The library of insights – and how will they find you? You can select Insights from the library which have your interest or you can just wait, because the insight will find you based on your role in the system and the relevance of the insight. We will continue to introduce new insights and measure how the existing are being utilized across the entire Gekkobrain Cloud. So at the end of the day – you can see this as a lot of Gekkobots doing a lot of automated analysis work for you, while you are busy with many other tasks. And on top of just the analysis, the Gekkobots tries to find solutions to the insights, they gain, so you don’t have to spend a lot of time figuring out, what the best angle of attack is to eliminate the problem. The Gekkobots will have that figured out for you. So we would like to change the phrase: “Problems created by humans can always be fixed by humans” into “Problems created by humans in SAP can always be fixed by the Gekkobots.